We'll be hearing much more about Gravity as the Oscar season heats up, but until then, we have a cool new poster to add to the plethora of other artwork we've seen commemorating the breathtaking Alfonso Cuaron film. It's no surprise that Mondo has introduced a new poster from artist Kevin Tong, and it's absolutely gorgeous. The artist has delivered some amazing work this year for The World's End (not to mention a triple bill of Edgar Wright's films last year) and also Guillermo del Toro's Pacific Rim, and his technical attention to detail is amazing. This one is actually better than any of the real posters. Look below! 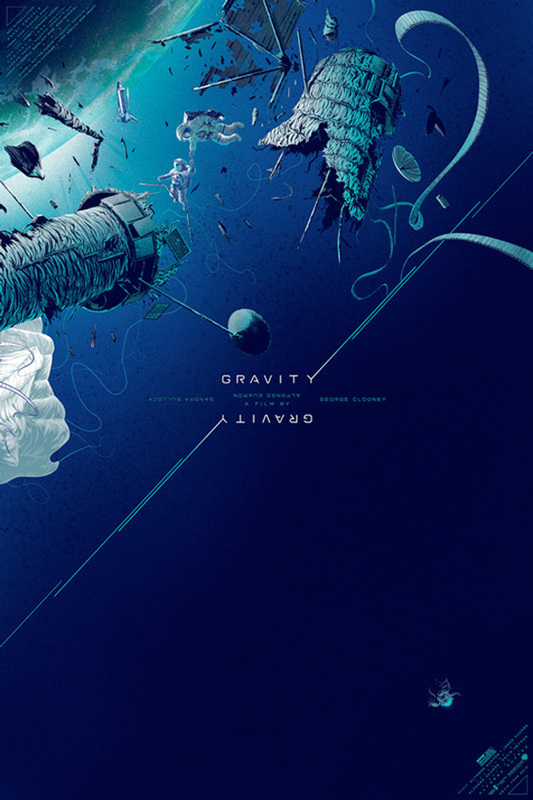 Tong says, "The video details the start to finish process of creating what is an official, limited edition, screen printed poster for Gravity, arguably the best movies of 2013. To emulate the dizzying effect of the movie, I deliberately designed this poster to have no true orientation i.e. there’s no right side up or down, it can be presented either way." The Poster is a 24×36 inch screenprint in an edition of 375. It costs $45 and, as always, will be on sale at a random time Tuesday November 5th. Find out when by following @MondoNews. Stay tuned, because with Thor: The Dark World arriving, we may get another Mondo poster.